The 2013 Pepsi IPL 6 is starting from April 3 2013. Many of you are already excited for this short form of cricket and watch to catch all the action. We’ve got some Android apps for you to follow your favorite team. This app will help you to follow the complete tournament. 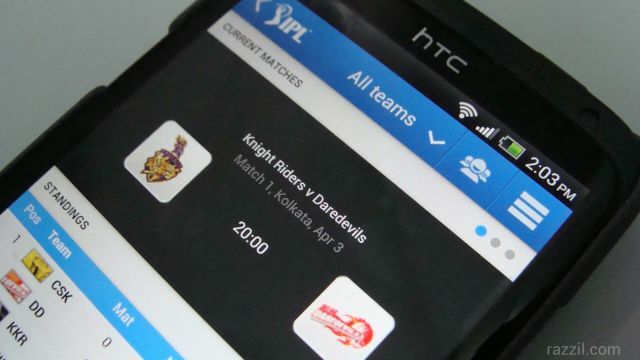 The Board of Control for Cricket (BCCI) has its official Android app and the app has been fully updated in anticipation of IPL 2013. The app offers IPL Standings, Schedule, Squads, news, video, venue information, scores and IPL statistics. Users can also participate in Pulse (Poll questions) and the Twitter stream. This is the best and must have app for IPL fans. The app is available freely on Play Store and it requires Android 2.1 and up. If you’re not happy with the BCCI Official app then you can use Yahoo Cricket android app. The app comes with a slew of features and user-friendly interactions. The app is available freely on Play Store and it requires Android 1.5 and up. If you know any good app, please let us know in the comment section.